What is the best place to live in the USA? Where is the best place to live in the USA? I am looking for a place that has reasonable real estate and cost of living, plenty of cultural opportunities and a university community. Any ideas? I have heard that Charlottesville, VA is the best small college town, but I've never been. Does anyone know what it's like? Tell me, where would you live if you could live anywhere? Where do you live right now? Is it my dream place? Here's the latest meme that is going to skyrocket around the internet: Planet (insert your name here.) Name a "Planet" store after yourself and include a list of what would be on sale inside. It's the Friday Five today. Aisle 1: Caffeinated hot drinks: strong coffee, Earl Grey teas, green teas, Irish breakfast tea, all properly served with milk and no sugar. Aisle 2: Indian food: specially prepared by my personal chef including plenty of hot, steaming poori bread. Aisle 4: Romance: everything necessary for a hot date with my husband including a babysitter, a cute outfit, a large chunk of free time, scintillating conversation and passionate glances from my one and only. Aisle 5: Sleep: a luxurious bed with soft cotton sheets, a down comforter, plush pillows, an excellent reading lamp, a pile of good books and magazines, and, of course, plenty of room for my darling husband. 12While Jesus was in one of the towns, a man came along who was covered with leprosy. [a] When he saw Jesus, he fell with his face to the ground and begged him, "Lord, if you are willing, you can make me clean." 13Jesus reached out his hand and touched the man. "I am willing," he said. "Be clean!" And immediately the leprosy left him. 14Then Jesus ordered him, "Don't tell anyone, but go, show yourself to the priest and offer the sacrifices that Moses commanded for your cleansing, as a testimony to them." And then, what joy!, a touch from Jesus Himself and his voice in your ears--"I am willing!" I have been praying this way this morning and am listening for His still small voice in my heart and anticipating his touch on my life. I am also reminded that this early morning time is so precious because Jesus himself often withdrew to lonely places and prayed. When I am up with Him, I am in good company. If marriage is a picture of Jesus and the church (the bridegroom and his bride) and if once we are saved it is secure and yet at the same time we must work out the day-to-day salvation with fear and trembling, why should marriage be different? Once we commit ourselves to one another--we are married--it is decided. To stay married, however, and to grow in oneness requires working at it on a daily basis, with intensity, intimacy and intentionality. A little fear and trembling works well for both our relationship with God and our relationship with our spouse. This commitment is important; it must succeed--I will make it my priority so that it will become all that it is meant to be. Plenty of time to sleep, to enjoy and to be alone with my one true love. Maybe next year for our 10th anniversary??? "In the calmness of the morning before the mind is hearted and wearied by the turmoil of the day, you have a season of unusual importance for communion with God and with yourself." Have nothing to do with godless myths and old wives' tales; rather, train yourself to be godly. For physical training is of some value, but godliness has value for all things, holding promise for both the present life and the life to come. Spiritual disciplines are all about training myself to be godly, just like weight training and cardio workouts are training my body to be lean and healthy. Fitness, whether spiritual or physical, is a daily commitment to faithfulness, a series of small right decisions, whether or not I have an immediate payback. I choose to get up early, pray, read through the One Year Bible and meditate on what God has done, even if I would rather roll over and go to sleep. I stretch out my muscles, do repetitions with free weights, and move to get my heart rate increased, even if it would be easier to go blog-surfing and drink another cup of coffee. And afterwards my heart is stronger, my day is more purposeful, and my outlook is brighter because of both of the valuable training exercises. The night before last, my 4 year old was up in the night, and I ended up sleeping in her bed to quiet her so that my husband could sleep. The next morning, I overslept, missed my workout, and felt sluggish and had a headache all day. It was a gray and rainy day. Today, after a good night's rest I put in a 25 minute strength training workout this morning with my exercise ball and free weights and figured I'd call it a day. Then at noon time while taking a break from school with the kids, I decided to do a cardio workout for 35 minutes. I feel SO much better. I never realized that I could actually get addicted to exercise. The goal is to consume as many calories as you can while still losing body fat and maintaining or gaining lean muscle. If your calories are already below normal, don’t restrict them further. Instead stick with your current amount and focus on becoming stronger and more active, so you can gradually increase your calories to a normal healthy level. If your calorie intake is already in a healthy range, decrease it only slightly, and only if necessary. A small reduction of about 250 calories a day, or 10-15 percent less than usual, is more likely to protect your lean muscle and less likely to trigger a slow-down in your metabolism. Following this type of routine, it’s possible to gain about one pound of muscle per week and lose about one pound of fat per week. The end result is that the number on the scale might not move much at all, it may even go up. Your clothes will get loser and your self-esteem will sky-rocket. Yet the number on the scale won't budge!?!?! It's at this point that a lot of people will chuck the weight training because they don't understand the physiology of what's happening. The truth is that when you're strength training it's possible to get smaller and heavier at the same time. Muscle is a much denser tissue than fat. A pound of muscle is like a little chunk of gold, while a pound of fat is like a big fluffy bunch of feathers. The fat takes up more space on your body. 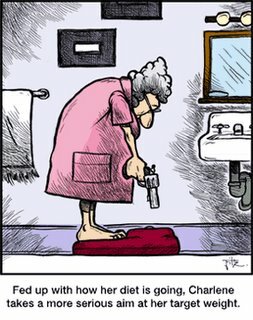 At this point, it's best to toss out the bathroom scale and rely on the way you look and the way your clothes fit. The scale can be misleading and discourage you when you're actually doing great. So, since I feel better, look better and sleep better, I will not give up. I know this is getting repetitive, but I want to maintain this physical discipline. At this point it is actually an exercise in faith for me, because I am doing the work without immediately seeing the rewards on the scale. But faith is the substance of things hoped for, the evidence of things seen, and I trust that my leaner, healthier body is on her way. Ask God for what I need. Ask God to be with me. Ask God to guide me right into the center of His will. Ask God to reveal Himself to those who don't yet know Him. Ask God to clean house in my heart. I want to be where God wants me to be and faithful to fulfill what He asks of me. Simple. A simple discipline. That is the theme of my year. I love the Self Challenge. I have been charting my workouts and the calories burned. It is very encouraging! One of these weeks, I will start dropping pounds, but in the meantime, I am stronger and happier. I need to burn 3500 calories a week to lose a pound a week. I will prevail. As I have been praying for God to give me a Lenten discipline, I have been receiving suggestions from some friends in the blogosphere including LutheranChik and Bald Man Blogging for which I am grateful. I have also been reading Karen Mains' book, Open Heart, Open Home, which I picked up on a whim last week. I have known Karen Mains' name for years, but have never read her work before. This is not fluffy Christian stuff--it is a surprisingly profound book on the the Holy Spirit, spiritual gifts, and hospitality as a spiritual discipline. She has been challenging me to look at my days in a fresh way. To remember that every moment of every day belongs to God. My home belongs to God. My every breath is God's. Inspired by her deep walk with Jesus, I want to take on a Lenten discipline of time. I don't exactly know how to articulate this, but I want to grow in the use of my minutes and my hours and start each day off giving them back to God. As I start each day, I will pray for God to order my day according to His plan, and I will meditate on scriptures that illuminate God's view of time. As the day progresses, I will be mindful of how I am spending this precious gift. Instead of just letting things happen, I will seek to be sure that my priorities are in order and that I am not letting my minutes evaporate into nothing. This does not mean that every moment must be busy. On the contrary, I believe I will spend more time in silence, in meditation and in listening to God. This Lent I want to reflect on my time and my place and hear from God what He would have me do. From one of the bloggers I have read the longest since I entered the blogosphere: Tod Bolsinger's post Dirty Foreheads. Repentance is literally to “change your mind.” In the famous words of Dallas Willard, “To reconsider your strategy for living based on the news of God’s Kingdom that is available in Jesus.” And that is what Lent is for, to reconsider your strategy for living. To begin a new process of deep consideration and reflection about your life. To reconsider what it means to follow Jesus, to plumb the mystery of Good Friday and Easter Sunday. To reconsider what your strategy for living should be, based on this good news.